The shifting narrative of The Godfather, Part II, tells the parallel stories of mob kingpin Michael Corleone (Al Pacino) in the late 1950s and his father Vito’s rise from a nine-year-old Sicilian refugee at Ellis Island to a powerful figure in the 1920s underworld. Vito’s success takes him back to his hometown in Sicily, face-to-face with aging Mafia chieftain Don Ciccio (Giuseppe Sillato). Don Ciccio has grown senile and mostly immobile in the two dozen years since he orchestrated the murders of Vito’s father, brother, and – ultimately – his mother. He has no recollection of the young boy that he orphaned when a dashing, dapper, and mustached gent from New York stands before him with a gift of olive oil… and a well-concealed knife. After more than two decades rising to success, wealth, and power in the United States, Vito Corleone’s return to Sicily finds him in a succession of suits that both signify his newfound status while also contrasting who he is against where he came from. Whether it’s the ivory summer suit worn for his arrival or the dark business suit for touring the olive oil warehouse, Vito stands out against the sun-kissed Sicilian environment as an outsider – albeit a successful one. His Sicilian friend, Don Tommasino (Mario Cotone), spends the duration of Vito’s visit wearing brown, and it indeed he that belongs. While Vito may be welcomed with open arms, he is still a visitor who now truly belongs in America. 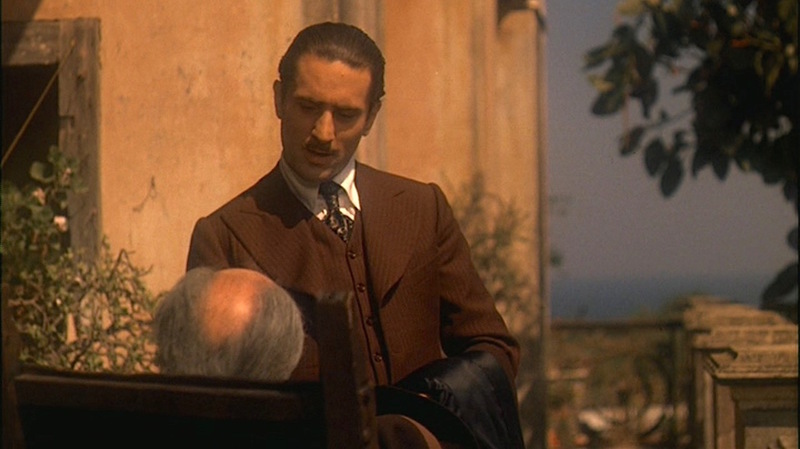 However, Vito dresses in a rust brown pinstripe wool suit for his mission of vengeance at Don Ciccio’s villa. The rich suiting still conveys his status and power, but the earthy color coordinates more with his dusty, sepia-toned surroundings. It’s a chameleon effect that identifies Vito as a trustworthy son of Sicily as Don Ciccio welcomes him on his porch. The suit was designed by Theadora Van Runkle and made for the film by Western Costume Co., as proven by the inside tags seen in this suit’s listing on The Golden Closet. The jacket and trousers were sold at a June 2016 “Profiles in History” auction with more details available from Invaluable. 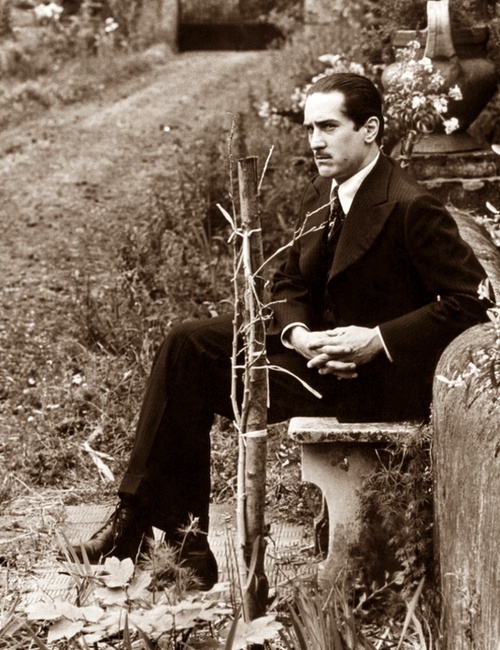 Tailored specifically for Robert De Niro, the suit was distinctively styled in the vintage tradition, with short and wide full-bellied peak lapels that were popular on men’s single-breasted suit jackets in the 1920s and 1930s. These lapels roll to the top of three closely spaced brown buttons all placed at least an inch from the jacket. The shoulders feature heavily roped sleeveheads, and the waist is suppressed with a horizontal seam circling the jacket at the center button. The bottom is cut more like a double-breasted jacket with squared, closed quarters that – combined with the suppressed waist and ventless back – create a full and flared skirt section of the jacket below the waist line. Each sleeve ends with a single button at the cuff, and the welted breast pocket slants toward the center. Another distinctive aspect of the suit jacket are the slanted, welted pockets on the hips rather than the traditional hip pockets with jetting or flaps along the top. The angle is far more slanted than is typically seen on a jacket like this, and this style of side-entry pockets more resembles trouser pockets than those of a suit jacket. Vito’s white cotton shirt with its long point collar, front placket, and button cuffs and the dark brown Deco-printed silk tie are both engulfed by the high rise of the suit’s matching single-breasted waistcoat, which Vito wears with all six buttons fastened. Vito completes his grisly task by wiping his bloody hands on the shirt of the freshly mutilated Don Ciccio. The finished film makes it difficult to discern much about Vito’s straight-leg suit trousers, as he is either seen primarily from the waist-up or in long shots where the overcoat in his hands covers up all but the fact that they are finished with two-inch turn-ups (cuffs) at the bottoms and are worn with dark brown leather derby-laced cap-toe boots that rise above his ankles. The auction listings don’t shed any light on whether or not the trousers have pleats, though Invaluable informs us that the trousers sold in 2016 have “velcro front closure and hook and eye snap waist,” though it’s most likely that the velcro was added sometime in the 40 years after production wrapped as it’s hard to imagine a method actor like Robert De Niro wearing pants with a velcro fly for a scene set in the mid-1920s… especially such a pivotal scene. The aforementioned overcoat that Vito carries is dark brown wool with a dark satin lining that shines in the sun. He never wears the coat, but he does wear a brown fedora with a brown grosgrain band that gets left behind in the ensuing fracas as Vito and Don Tommasino make their escape. Olive oil in hand, Don Tommasino and Vito Corleone pay a house call on the decrepit Don Ciccio. Happily married to Carmela for half a decade, Vito wears a gold-toned wedding band on the third finger of his left hand. Vito Corleone channels his rustic heritage when he returns to Sicily in a sharp brown three-piece suit with unique, vintage-inspired details. I like that Vito generally dresses in a way that is unobtrusive, slightly rustic, and only dresses up for his return to Sicily as a successful businessman and for the day of his daughter’s wedding. Thank you for the detailed analysis. I need to rewatch this soon. Question: Are the pockets a period detail, or unique to this suit? I’ve never really seen pockets like that on a suit jacket. 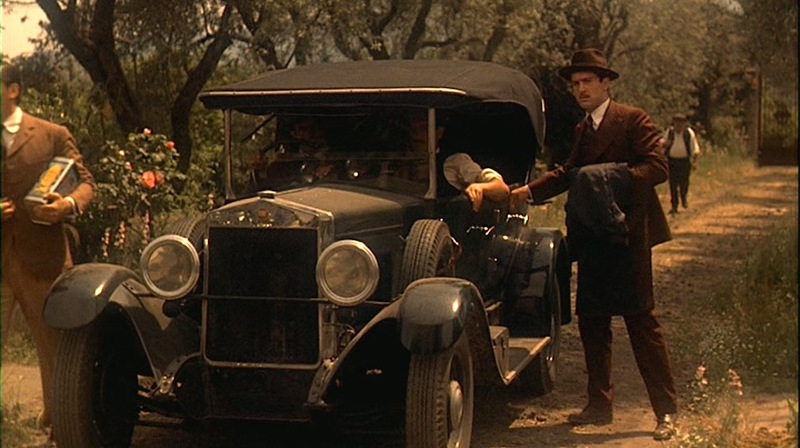 The car use in this scene is a Fiat 503, from between 1925 or 1927. You should had explained it on this post. Excellent write up. I think that l can help with information on the trousers. I believe that they are flat front and are worn with a belt . My reason for saying that they are flat front is because ALL of Vito’s other trousers in the Godfather and Godfather part II are flat front. I would also say that the trousers are worn with a belt , because there is a Behind the scenes photograph of Robert De Niro wearing the ivory wool double breasted suit with a white coloured belt , so it is not inconceivable that he would have all his suits tailored with a belt. From my humble observations , l would conclude that Vito stopped wearing suspenders after he became a gangster ( Around the time , he started growing the moustache ) . 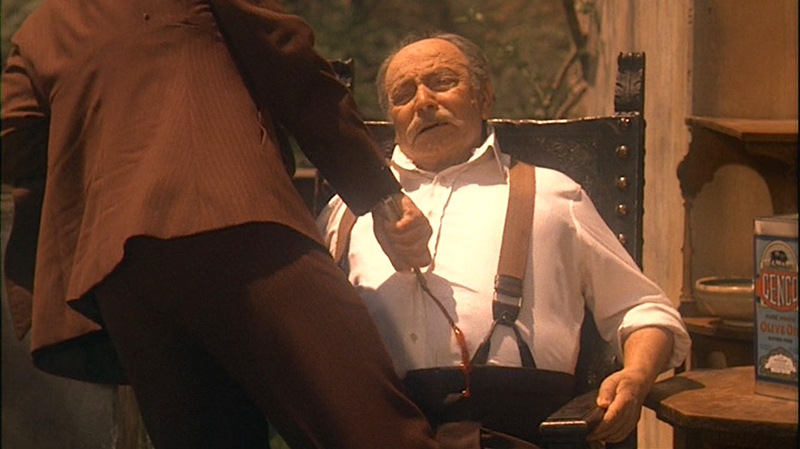 He would wear suspenders with his brown wool flat front work wear trousers ( which appears to be the only pair of trousers owned by Pre – Gangster Vito ) , before he became a mobster. 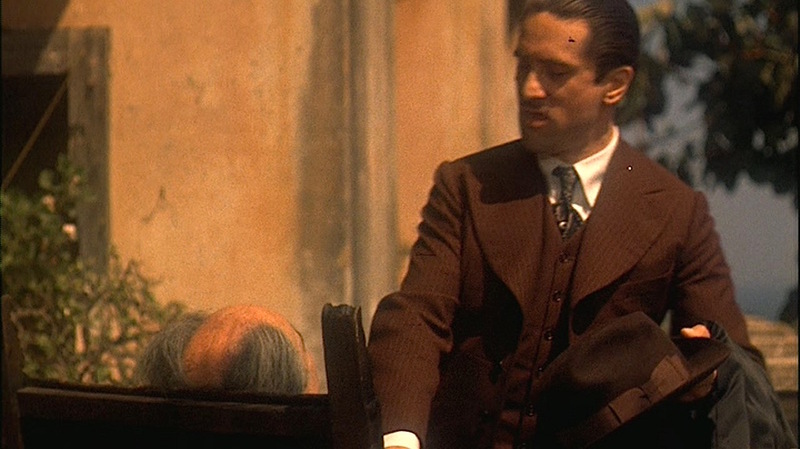 2) The Grey Herringbone Wool Suit Vito wears in the Godfather part I where he first meets Solozzo and later gets shot . 3) The Double Breasted Dark Three piece suit which he wears after Sonny’s death ( A behind the scenes picture shows the trousers sagging under the vest , and a belt holding it up ). 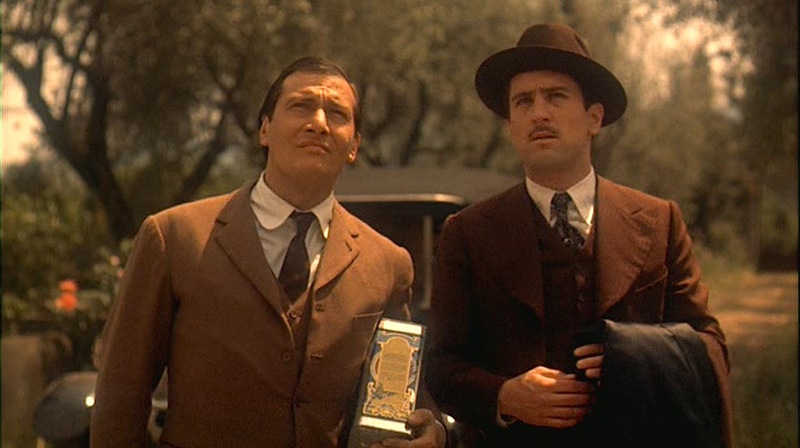 Also All of Vito’s casual trousers in the Godfather are worn with a belt , like the ones he wears when he and Michael are talking in the garden about Barzini and the ones he wears when he dies. Thus , l think that these trousers are also worn with a belt. 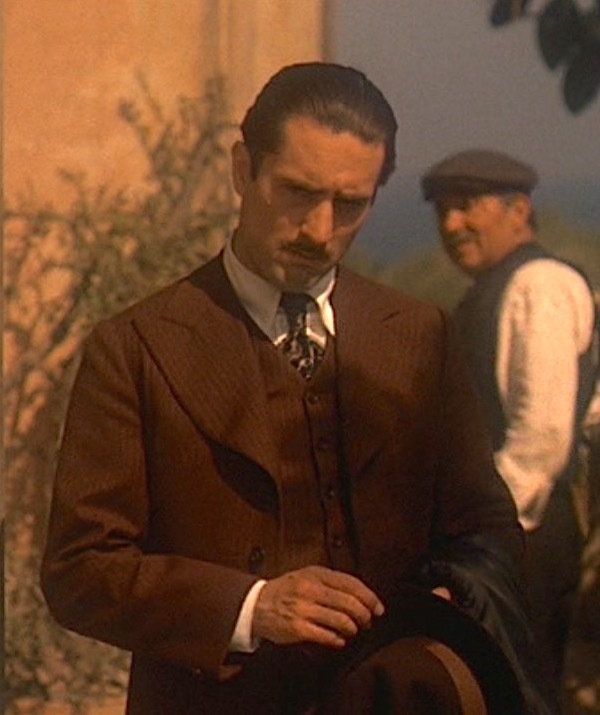 Further more there is a deleted scene in Godfather part II , where Vito is wearing the vest and trousers from this brown suit and creeping into a bedroom to stab a sleeping man ( who killed his mother 30 years ago ). Then , you can see that the trousers are worn with a belt and not suspenders.